Plugging away, a little bit here and there as I study to finish a Masters degree and use quilting as "recess" when my brain starts to hurt! This one was started in 2008 just to use some floral charm squares that someone gave me. 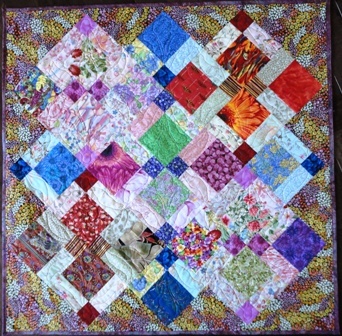 It is not quite 40" square and will likely find a home on someone's knees in a nearby senior's care facility. I'm also quilting the cherry tree (on the right) with lots of quilting, so it is taking lots of time. I'm doing it on my Baby Lock because the quilting is more intricate than my skill level on the longarm. It will be good to have it completed as I've procrastinated long enough. I finished the top 2 1/2 years ago. Granddaughter Kali has so much patience with me! You're busy busy! Looking good.